1 C None No Power Seat 1 C is an Economy Class Exit Row seat that has extra legroom. The tray table is in the armrest, making the armrests immovable and slightly reducing seat width. There is no floor storage for this seat during takeoff and landing. 1 D None No Power Seat 1 D is an Economy Class Exit Row seat that has extra legroom. The tray table is in the armrest, making the armrests immovable and slightly reducing seat width. There is no floor storage for this seat during takeoff and landing. 12 C None No Power Seat 12 C is an Economy Class seat located in the last row of the plane and may have limited recline. The proximity to the lavatory and galley may be bothersome. 12 D None No Power Seat 12 D is an Economy Class seat located in the last row of the plane and may have limited recline. The proximity to the lavatory and galley may be bothersome. 13 A None No Power Seat 13 A is an Economy Class seat located in the last row of the plane and may have limited recline. The proximity to the lavatory and galley may be bothersome. 13 B None No Power Seat 13 B is an Economy Class seat located in the last row of the plane and may have limited recline. The proximity to the lavatory and galley may be bothersome. 2 A None No Power Seat 2 A is an Economy Class Exit Row seat with extra legroom. The proximity of the propellers makes this area very noisy and obstructs the view. The tray table is in the armrest, making the armrests immovable and slightly reducing seat width. There is no floor storage for this seat during takeoff and landing. 2 B None No Power Seat 2 B is an Economy Class Exit Row seat with extra legroom. The proximity of the propellers makes this area very noisy and obstructs the view. The tray table is in the armrest, making the armrests immovable and slightly reducing seat width. There is no floor storage for this seat during takeoff and landing. 2 C None No Power Seat 2 C is an Economy Class seat. The proximity of the propellers makes this area very noisy and obstructs the view. 2 D None No Power Seat 2 D is an Economy Class seat. The proximity of the propellers makes this area very noisy and obstructs the view. 3 A None No Power Seat 3 A is an Economy Class seat. The proximity of the propellers makes this area very noisy and obstructs the view. 3 B None No Power Seat 3 B is an Economy Class seat. The proximity of the propellers makes this area very noisy and obstructs the view. 3 C None No Power Seat 3 C is an Economy Class seat. The proximity of the propellers makes this area very noisy and obstructs the view. 3 D None No Power Seat 3 D is an Economy Class seat. The proximity of the propellers makes this area very noisy and obstructs the view. Hawaiian Airlines operates the Aerospatiale ATR-42 on short-haul flights through its connector airline 'Ohana. This aircraft flies solely with 48 seats of Economy Class. Beware that the front of the aircraft can be loud. For a quieter ride, sit farther back on the aircraft. Boarding is from the rear, so don't pick seats toward the front. The props are right at Row 3, so it makes for a noisy take-off. Seats are a bit cramped, and overhead space is much smaller than HA's 717s, so only small personal sized bags are allowed into the cabin. Larger carry-ons must be gate checked. As a pond-jumper this plane is fine, but remember to travel light. 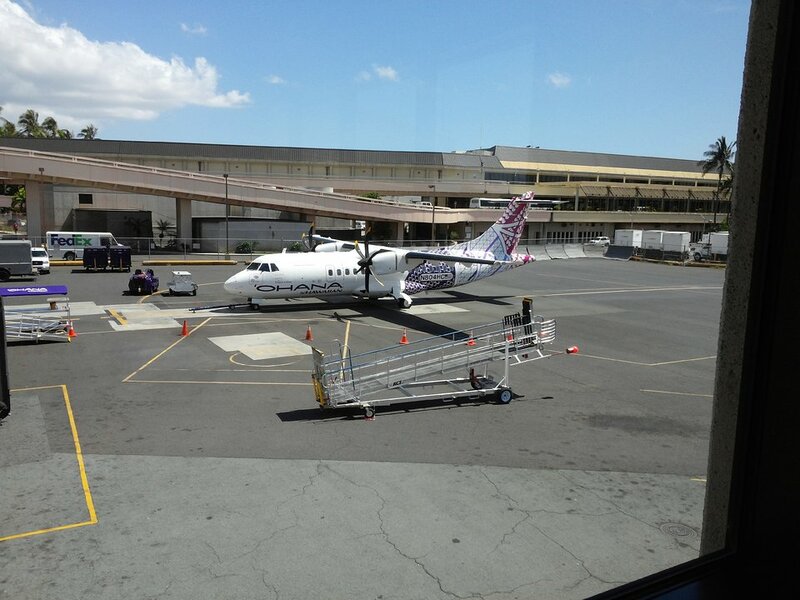 Hawaiian Airlines flies 1 versions of Aerospatiale ATR-42.